This week on the Secret Library, we hear from guest author Emily Owen, who is conducting research into the textile industries of Leeds and West Yorkshire. Stowed away in the University of Leeds Library is Special Collections – home to everything from rare medieval manuscripts to the notebooks of famous poets like Tony Harrison, and including a collection of multimedia materials known as Leeds Archive of Vernacular Culture (LAVC). For a long time this unique and fascinating material has been somewhat overlooked, remaining a closed collection. The LAVC consists of materials from the former Leeds Institute of Dialect and Folk Life Studies, an institute located at the University of Leeds from 1964 to 1983, and which conducted research into dialect and folk life, seeking to capture traditions, crafts and ways of life that nowadays might seem very ‘back in the day’. Among this material are four oral history interview recordings, created in the 1980s, which formed the basis of my research project about the history and language of the West Yorkshire textiles industry. These were conducted with former mill and tailoring workers from the twentieth century around Leeds, which was once the centre of Britain’s textile industry. These recordings in the LAVC include the testimony of a former cutter at the tailors, Burton’s, who talks about the practical jokes the cutters would play on one another to break up the monotony of the job (one involving hiding a dead mouse between the layers of cloth). 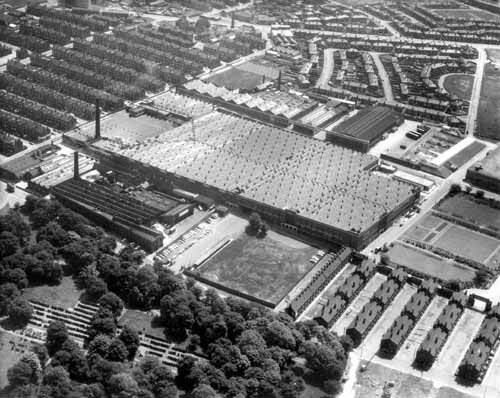 Another was with a woman who worked as a winder at Yates mill on Broad Lane, Bramley, which was one of the mills that supplied Burton’s with the worsted cloth to make their suits. While there were stories of hardship, poor wages and long hours in these interviews, one thing that shone through all of them was the sense of comradery between the speakers and their fellow workers, with one woman saying the company was what make it enjoyable for her and what she missed most. Yet these interviews are also a window onto another time, with all of the speakers coming from relatively poor upbringings and growing up in the 1910s and 1920s. There were comments of eight or ten houses sharing a lavatory, or one man going around barefoot as a child until he was given his first pair of boots at the age of eight – things that are unthinkable for today’s generation of children in Leeds. Over the next few months, I hope to discover new stories and memories like these from former and current textile workers, to create a picture of how the textile industry in West Yorkshire has changed over time. To do so, I need to find volunteer speakers. The history of West Yorkshire as a whole has been deeply intertwined with textiles, wool and worsted especially, since at least as far back as the fourteenth century, when many landowners would spin or weave wool in addition to rearing livestock. When the Industrial Revolution arrived, the weaving of wool cloth became a mechanised process, with mills sprouting up all across the West Riding. Whole families would work at the mill – with fathers and mothers passing the tricks of the trade onto their sons and daughters. The wool textile trade boomed throughout the late nineteenth and early twentieth century (although there were some turbulent times). 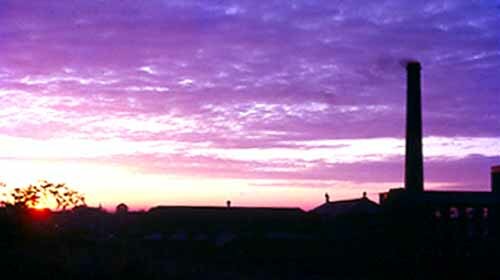 Bradford was known as the ‘International Wool Capital of the World’, a title it retained well into the 20th-century. Mill work has also produced many words and phrases which are still woven into the modern-day lexicon. For instance, the expression ‘on tenterhooks,’ to mean agitated or in suspense about a future event, has its origins in the frame, or ‘tenter’, which the woven cloth was stretched out on – perhaps similar to the agitated person’s stretched nerves! 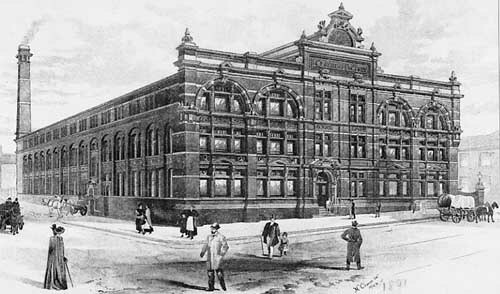 But in the 1850s, a new industry was established in Leeds – that of the ‘ready-made’ clothing industry – when John Barran established his first wholesale clothing factory in Alfred Street. By the 1930s, the industry was dominated by the so-called ‘multiple tailors’ who both manufactured and sold their own products, primarily men’s suits. These companies concentrated mostly on ‘made-to-measure’ as opposed to ‘ready-made’ suits. 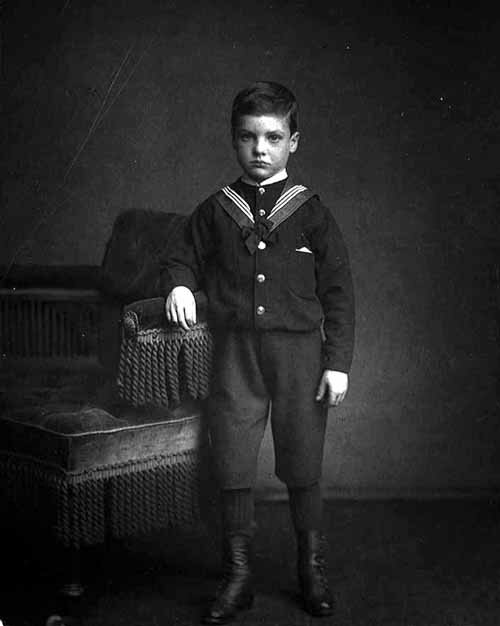 The customer would place an order for a suit in one of their retail outlets, and his choice of cloth, pattern, and also his measurements, would be sent back to the factory where a suit would be made to his exact specifications (and all without the aid of computer technology) before being sent back to the shop for the customer to try on. According to Katrina Honeyman’s history of the Leeds Clothing Industry, Well Suited, in the 1930s to the 1960s the Leeds multiple tailors produced about half of all suits bought by British men. Much of the cloth for these ‘bespoke’ suits was woven by West Yorkshire looms. Burton’s were undoubtedly the largest of the multiple tailors. At its peak, there were over 10,000 people working on-site producing 30,000 suits a week at its Hudson Road factory, which was said to be the largest clothing factory in the world. It is claimed that the phrase ‘the Full Monty’ originally meant a three-piece suit from Burton’s. While there were a number of factors which led to the decline of both the mills and the tailoring factories over the course of the last century, there is one significant factor common to both: cheaper imports from abroad. British companies simply could not compete against clothing and cloth that could be produced much more cheaply in other countries. Dwindling demand, coupled with a difficulty in attracting new workers into the industry, meant that many firms gradually went out of business. 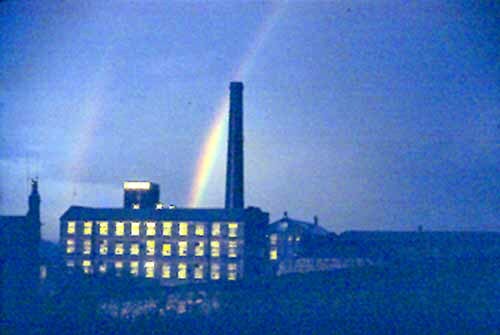 Some mills such as Armley Mills in Leeds and Moorside Mills in Bradford were fortunate to be converted into industrial museums. Many more of the multiples survived by concentrating solely on the retail aspect of their business, even though they ceased to manufacture their own garments. Burton’s is now known as ‘Burton Menswear’, a leading men’s clothing and fashion retailer, while the tailors Hepworth’s became the high-street retailers Next in 1983. But nor can West Yorkshire’s link to textiles be relegated entirely to the past: a number of mills still produce high-quality wool and worsted cloth, often focusing on niche markets, rather than the mass market. 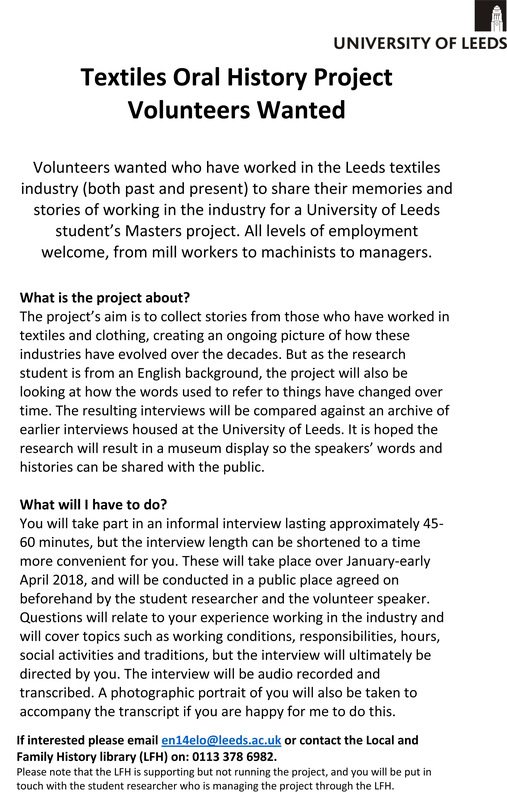 If you, or someone you know, might be interested in sharing memories or stories of working in the West Yorkshire textile industry, please contact me by email en14elo@leeds.ac.uk, or call the Local and Family History department on 0113 378 6982, who will then put you in touch with me.